National Review’s Jim Geraghty recently noted that some on the right are too quick to jump on the establishment media’s bias as “an excuse for when their preferred candidates and advocates just don’t get the job done and fail to win over persuadable voters.” After all, media bias is rarely the decisive factor between victory and defeat, the establishment media is not quite as powerful as it was in decades past, and complaints about media bias give off a whiff of victimhood unlikely to move voters in the mushy middle. It is a useful reminder, but it increasingly seems like it is the establishment media that needs a similar reminder. If you are a news junkie, scarcely a week goes by without seeing those in the establishment media — in anything from an Andrew Sullivan screed to a tweet from Associated Press national politics and elections reporter Phil Elliott — suggesting that the yokels in flyover country are soaking up misinformation from the likes of Rush Limbaugh, Fox News and conservative pundits generally. It would be a convenient excuse for the Democrats’ midterm losses, but it doesn’t stand up under scrutiny. The reality is that the establishment media still reaches a much larger audience than conservative media does. Moreover, according to the Pew Research Center for People & the Press, Rush Limbaugh’s audience is among the most well-informed of any media outlet, and Fox News viewers are slightly better informed than those of its competitors on cable and broadcast television. However, it is notable that the same Pew data shows that the conservative media audience is overwhelmingly conservative. The establishment media’s audience is not only larger, but also much more politically diverse. If conservative media had the influence many in the establishment media believe it does, how did Republicans lose Congress in 2006 and the White House in 2008? Limbaugh and FNC were both on the air throughout the period. They would be considered a constant in the equation. Thus, the failing fortunes of the Obama administration and Congressional Dems must be largely attributable to other factors. If a majority of Americans think Obama’s policies are moving the country toward socialism, it’s not just because Rush Limbaugh says so, let alone Jonah Goldberg or Stanley Kurtz. Indeed, columnists like Janet Daley and Anne Applebaum have recently noted that the Obama administration has been pushing this country in the direction of Euro-socialism (esp. on healthcare) at the same time that Europe is being forced away from it — but I doubt they are merely parroting Limbaugh and FNC, any more than the average bar patron in Ohio is regularly reading Daley or Applebaum. Rather, people in the mushy middle are still largely making their political decisions based on their personal observations of the world around them and the information they get from the establishment media. The “Limbaugh effect,” if any, is not primarily observed among the benighted proles in the vast wasteland between the progresive meccas of America’s coasts. Instead, it can be seen in a fairly broad swath of the establishment media, which has leapt on claims of media bias with a sudden vengeance, despite the conservative media being less powerful and influential than the establishment media. As such, the whiff of victimhood from the establishment media proves even more malodorous. Sockpuppet Friday—The “Bristol Pwns Olbermann” Edition!!! But while I understand completely why Bristol felt the need to respond, really the better course of action would have been to ignore Olbermann. “Disgusting Mail Order Trash;” Why is Drudge Linking to Alex Jones’s Site? If you click on the circled link you go to a page on Alex Jones’ website, Prison Planet, asserting that reporter Drew Griffin was put on a terror watch list after a report criticizing the TSA. Only there is one problem: not even CNN alleges that he personally is on the watch list. Watch the video. It’s another man sharing the same name. Which of course creates hell and havoc for the more famous Griffin, but that also blows the revenge story out of the water, right? …..(C) occur primarily within the territorial jurisdiction of the United States. (emphasis added.) The “and” at the end of (B)(iii) demonstrates that definitions under A, B, C are conjunctive, meaning you have to have all three parts satisfied for there to be a criminal violation. With the “or” at the end of (B)(ii), this means that in order to find that a person is a domestic terrorist, the person must meet the requirements of (A) and (C), and meet at least one of the requirements under (B)(i)-(iii). In other words, Prison Planet’s excerpt left out the predicate requirement that you must be actually convicted of a crime in America. So merely dissenting doesn’t make you a criminal. Duh. Now I will confess, I have never received the full set trading cards of internet kooks, liars and radicals, so I didn’t know off the top of my head who Jones was. So this might be old hat, but I googled around and apparently he has been a racist, paranoid conspiracy idiot and Truther for decades. For instance a quick scan of this page proves he is a truther. And this video is where I finally remembered where I heard that name before. It’s a little hard to watch all these years later. It starts off with Vodkapundit mocking some people who wanted to levitate the Denver Mint. No, that is not a typo. They wanted to use their psychic powers to actually lift it, which puts in sharp relief Steven Den Beste’s point in this classic essay Government By Wishful Thinking (if you never read it, you really owe it to yourself to do so). There really are some people who think that wishing for something will make it happen. Scary. All of which raises the question, why is Drudge linking to this man’s website? He is a lying, racist, paranoid, idiotic, conspiracy-mongering truther. He should be marginalized into that zone of moronic convergence where David Duke makes common cause with Cindy Sheehan. He should not be getting hits from Drudge, and my respect for that site just went down a notch. And please don’t tell me that Rivera is about to be sucked in, next. Oy vey. Okay, this will really earn me my nerd card, but do you any of you remember an animated show around the late 70’s called Star Blazers? 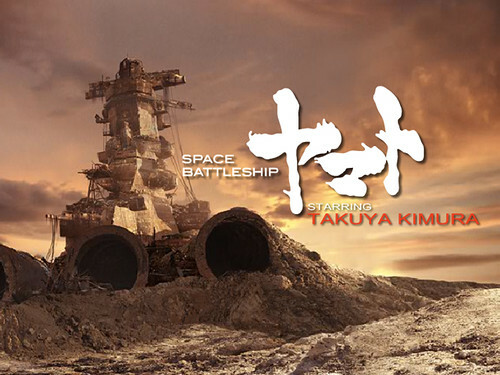 The plot was that Earth was under constant attack by aliens, but the humans take a Battleship, called the Yamato, and turn it into a space ship, and fly to a planet that promises to hold the hope for Earth’s salvation. It was different and kind of mature for a kid’s cartoon, with an Ender’s Game vibe to parts of it, and a dab of Japanese nationalism on top given that the ship was asserted to be a Japanese battleship sunk during World War II. In Japan it was called Space Battleship Yamato, but when they brought it to America they presumably wanted to play down the nationalism and perhaps make it less obvious that this was a Japanese cartoon, hence the name Star Blazers. Well, in Japan, they have turned it into a live action movie that looks like it has some real potential. For people of a certain age, there is a cool nostalgia factor there, similar to when the Transformers movie came out. You can read some about it and watch a few minutes of footage, here. Or watch an English subtitled (with a Steve Tyler song!) trailer, here. IGN sees a strong influence from the most recent Star Trek. I see an awful lot of the recent BattleStar Galactica, especially in the fighter sequences. Which is encouraging because BSG provides a good template for how to update this film: take the original and make it grow up. If only they did that with the Transformers. And here is a pretty cool looking poster, featuring the ship before they fixed it and turned it into a space ship. Yes, I know that would almost certainly be impossible, but it is still kind of cool. No word on when it is coming to the U.S. although the fact it has an English website suggests that they recognize that some Americans still fondly remember the series and it will get here sooner or later if only to cash in. Update: For the commenters with fond memories of the show, I will point out that the original movie is in Netflix, and last I checked you could stream it into your computer, or into your TV using a Wii, Xbox 360 of Playstation 3. I think it was under Star Blazers. Update (II): I have been informed that I was mispelling “Yamato.” Which means I have been officially out-nerded (which is hard to do). Update (III): In the comments Captain Ned informs us that there really was a Yamato, and, um, it doesn’t look very spaceworthy. Thanks alot for ruining my suspension of disbelief!